25% Off Ice Skating at Blackpool Pleasure Beach Arena Includes free skate hire! Blackpool Pleasure Beach is regularly voted one of the best theme parks in Europe, and is one of the most popular tourist destinations in England, with millions of visitors every year. You can stay at the resort there or visit just for the day at any time of year, and are always guaranteed to have a fantastic time with plenty of excitement. You can save on the experience too, by using the fantastic offers we have here at vouchercloud. The notorious selection of theme park rides will give all adrenaline junkies their fix of pulse-racing thrill, while the shows will keep your calendar jam-packed full of top draw entertainment, including magic, dancing on ice and horror shows! Most famous for its rides and shows, Blackpool Pleasure Beach also has some brilliant places to eat, games and other fairground style attractions, and of course, lots of fun souvenirs to shop for. Perfect for all the family; isn't it time you embraced the staycation and booked your trip to Blackpool Pleasure Beach? How do I use my Blackpool Pleasure Beach discount code? Go to your basket, and click 'Yes' where it asks " Do you have a discount code?" Sign up to vouchercloud and we'll keep you in the know about any new great value discounts you can use at Blackpool Pleasure Beach and other great UK theme parks and attractions! 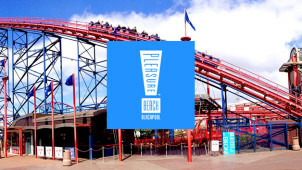 Check out Blackpool Pleasure Beach's Facebook page to be the first to hear about exclusive deals! Can I stay overnight at Blackpool Pleasure Beach? Can I get 2019 season passes? Yes, choose your season wristband here. Do children need adult supervision at Blackpool Pleasure Beach? The policy on children is that there must be someone responsible and over the age of 12 with them. Teens do not need to be accompanied to visit the park. Can I buy Blackpool Pleasure Beach tickets online? Can I bring my dog to Blackpool Pleasure Beach? Dogs are not allowed on the grounds of Blackpool pleasure beach, with the exceptions of guide dogs and other service animals, which must be kept on a lead and are not allowed in any of the rides. You can also reach them online via their contact form. Opening times are typically between 11 am - 5 pm. Saturday typically sees longer opening hours - 10 am - 6 pm - but opening times can vary seasonally. Blackpool Pleasure Beach is jam-packed with intensive theme park rides, attractions and feel-good shows, making it an ideal summer day out - or winter, if you're feeling ready to brave the Blackpool cold! The new double-launch roller coaster, ICON, is the first of its kind in the UK and this isn’t an experience you’ll forget in a hurry! Treat the whole family to a day out and a Blackpool Pleasure Beach discount code will have you saving on some serious thrills. Expect to feel like a Formula 1 driver as the ICON launches you on a mind-blowing journey of high speeds and acceleration throughout the park - Blackpool Pleasure Beach is sure to blow your socks off anyday! In Blackpool Pleasure Beach’s rich history, it has been an innovator in rides. The Big One, which launched in 1994, was the fastest, tallest and steepest rollercoaster on Earth at that time, and is still the tallest in Britain, and Valhalla was originally the largest indoor dark ride in the world, a title it held until 2016. Just launched in summer 2018 was ICON, the first double launch coaster in the UK! It’s not just the rides that bring people to Blackpool Pleasure Beach, there are loads of great shows and events too. As well as the annual favourite Hot Ice, this summer will see performances from Only Fools & 3 Courses, ventriloquist Steve Hewlett and the Circus of Horrors. Book your tickets with the Blackpool Pleasure Beach offers from vouchercloud to save money on admission. These shows are worth the trip alone!